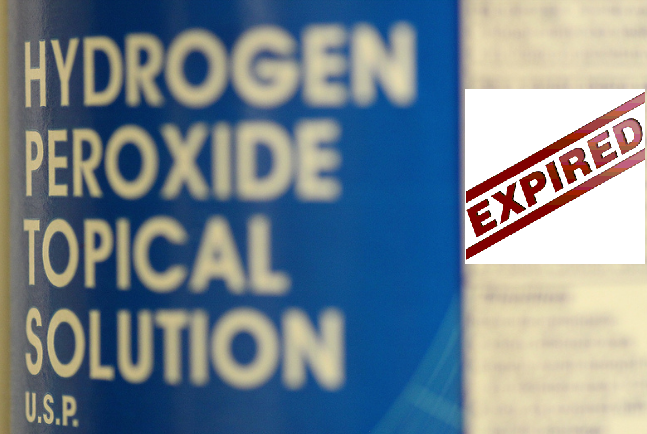 Home » Medicines » Expired Medicines » Does hydrogen peroxide expire? Hydrogen peroxide is an antiseptic used to prevent skin from infections in minor cuts, burns, and scrapes. It is a common household ingredient that is used as a mouthwash to rinse the mouth and minor mouth irritation due to cold sores or gingivitis. Hydrogen peroxide, when applied to an infected area, releases oxygen causes foaming that helps clean the area effectively and removes dead skin. What are some properties of Hydrogen Peroxide? Hydrogen peroxide is a very powerful oxidizing agent; it is highly stronger than potassium permanganate and chlorine. Upon decomposition, it is converted to hydroxyl radicals. Hydrogen peroxide is very safe despite its powerful properties because it is completely miscible with water. Hydrogen peroxide is a decomposition product of many organisms that decomposes the hydrogen peroxide into the water and oxygen. It is manufactured by natural purification system that is by the action of sunlight on water. Unlike all other chemical oxidants, hydrogen peroxide does not have any problem of chemical residues or gaseous release. Hydrogen peroxide is widely used in controlling pollution, bleach textiles, paper products and processing of food, minerals, petrochemicals and household material such as detergent. It is readily available in the market in drum and bulk quantities in 35% or 50% by weight concentrations. Hydrogen peroxide is an extremely versatile product as it can inhibit the growth of microorganisms in bio fouling of water circuits as well as encourage the growth of microorganisms in bioremediation of contaminated soils and waters. Likewise, it can treat iron and sulfides (that is easy to oxidize pollutants) and solvents, gasoline, and pesticides (which are difficult to oxidize). Hydrogen peroxide can often oxidize one pollutant over another by adjusting the conditions of the reaction for example – pH, temperature, catalyst addition, reaction time and dose. What is hydrogen peroxide used for? It is used as a bleaching agent and an oxidizer. It is found in toothpaste formulas and used as a disinfectant in the cleaning of a wound. Used as a household cleanser to remove blood and protein stains, as well as beneficial in removing mold that has grown around bathtubs and showers. Due to its bleaching properties, it is effective as bleach for laundry. It effectively cleans the tile and grout between the tiles. It is highly beneficial in removing the foul smell and bad odor. When used with baking soda, it is used to remove pet odors. A dilute solution of Hydrogen peroxide is effective in killing the pathogens from the fruits and vegetables. Cleansing of fruits or vegetables is recommended before consumption. Used to support the roots of houseplants, when mixed with 2 gallons of water. Used as an emetic for pets. How Hydrogen peroxide is used to treat wounds? Enzyme catalase that is present in the skin breaks this chemical and releases water and oxygen. Where water cleans the wound and released oxygen eliminates the bacteria. Thus reduces the risk of developing an infection. What are some dangerous effects of hydrogen peroxide? As described above, hydrogen peroxide has many benefits but it may prove harmful for our skin when used in higher concentrations. One should use optimal quantities of this chemical when used on skin. Burns: Hydrogen peroxide should never be used to treat burns because it already has the tendency to cause redness and blisters on the skin. When applied to burns, it may prove corrosive and worsen the condition of the burns. Allergic reactions: Hydrogen peroxide is responsible for increasing allergic reactions. Hair dye products that are commonly used at homes contain PPD-based dye and hydrogen peroxide as dye. When reaction of hydrogen peroxide and PPD occurs, the dye gets oxidised and coloured. Hydrogen peroxide in this form can cause allergies because of which you can feel burning sensations, swelling and redness of skin. 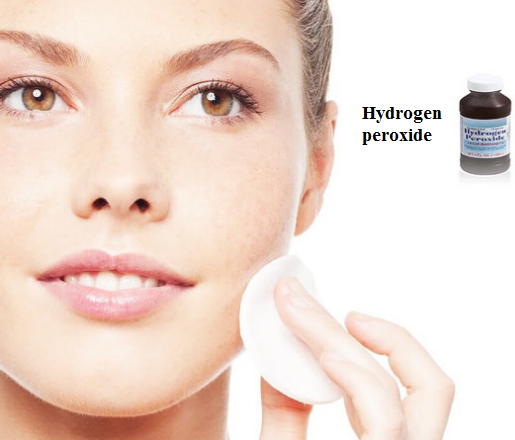 Damage to the skin: Hydrogen peroxide can damage the skin by oxidative stress. Only 3% solution of hydrogen peroxide is safe as a disinfectant, more than 8% concentration is extremely dangerous. Concentrated hydrogen peroxide exposure can lead to local tissue damage. Intake of concentrated hydrogen peroxide (that is more than 35%) can lead to the generation of excessive volumes of oxygen inside the body. Which can cause its maximum solubility in the blood and arterial embolism can occur. Rapid generation of oxygen inside the body can rupture the hollow viscous cavities. What happens when hydrogen peroxide is exposed to air? When Hydrogen peroxide is exposed to air, a chemical reaction will start and it starts to react to form water and the liquid Hydrogen peroxide will changed into plain water. You should avoid dipping your finger or any swab in to the bottle of Hydrogen peroxide as it may affect the potency of this chemical and its effectiveness can be reduced. As a disinfectant, the strength of Hydrogen peroxide should be 3% and anything above 8% is corrosive to skin. Therefore, if you have a bottle of Hydrogen peroxide from a long time, you should replace it as it may not give you any significant effect. Like many other chemicals and household products, Hydrogen peroxide also does expire. Hydrogen peroxide is made up of two molecules, one is water, other is an unstable form of oxygen, and you are left with the only water molecule when it is expired. Hydrogen peroxide produces a fizz when poured on any surface, but when you do not experience any kind of fizz from hydrogen peroxide, it means your Hydrogen peroxide have lost its potency and will be no longer effective. A solution of 3% Hydrogen peroxide mainly used as disinfectant and it has a shelf life of one year that stays up to 3 years when remained unopened. It is a weak acid and if the container remained sealed, it may retain its full strength for longer period. Once you open the container or bottle of hydrogen peroxide, its potency last up to 30 to 45 days only and about 6 months of useful activity. Hydrogen peroxide molecule is unstable thus the extra oxygen atoms form O2 molecules, leaving water behind. This dissociation begins when the hydrogen peroxide is manufactured, and then continues on the shelf and during use, until eventually there is only water that stays in the bottle. Can I use hydrogen peroxide that expired 1 year ago? Hydrogen peroxide is an effective oxidizing agent and it has shelf life of 1 – 3 years when unopened. If you have an unopened bottle of Hydrogen peroxide that is expired one year ago, you can use it but still the potency of this chemical is not guaranteed after a year. It may produce or may not produce the desired effect. But if you have an opened bottle of Hydrogen peroxide since long time (more than 6 months) than it will surely not produce any effect because after 6 months, opened Hydrogen peroxide get converted into pain water and will not be effective. As a bottle of Hydrogen peroxide is not very expensive, you should dispose the previous expired bottle and should buy new one, when needed. The bottle of Hydrogen peroxide should be opened at the time of use, not before than that. Expired Hydrogen peroxide is not harmful or detrimental but it losses it potency after few days when opened. Can expired hydrogen peroxide cause side effects? Expired hydrogen peroxide will certainly be less effective or total ineffective but it is not harmful and should not cause side effects. So, antiseptic properties will be lost once hydrogen peroxide expires and the effects will be the same as you are using the water. How to know if hydrogen peroxide is still good? If you have a bottle of expired Hydrogen peroxide in your closet, and you are not sure about its potency, you can do some small test to check the effectiveness of this chemical. Pour the little amount of Hydrogen peroxide into the sink. It will start producing bubbles if it is good. If you do not get any fizz or bubbles than your Hydrogen peroxide is just a bottle of plain water and you should replace it. One should not transfer this chemical into another clean container, as air will interfere with its potency. You should store it in a cool place as heat can enhance chemical reactions that might lead to decomposition of Hydrogen peroxide thereby reduces its shelf life. One should store this bottle away from exposure to direct light as light can react with peroxide and decompose it. You can test expiry of Hydrogen peroxide bottle by visually checking it. If the bottle of Hydrogen peroxide is bloated, it is expired. It is bloated due to decomposition that occurred inside the bottle. Decomposition of this chemical can lead to release of oxygen which in turn expand inside the bottle and cause it to bloat. Put a drop of Hydrogen peroxide on something that contains enzyme catalase for example potato. When you put it on a cut, it will make Hydrogen peroxide bubble instantly. If your Hydrogen peroxide produces bubbles immediately then it is good for use and is still potent. An expired chemical will not produce any bubble, as it will not react with enzyme catalase. How to dispose of hydrogen peroxide? Hydrogen peroxide should be disposed of with simple treatment. You can pour the chemical safely into the sink or into a toilet. One should not splash the chemical and should wear protective gear while disposing such chemicals. Dilute the solution with a ratio of 1:5 with tap water of ambient temperature. One should balance the pH from 6 to 8 using baking soda (common household ingredient) approximately 1.5 tbs per litre. Pour the solution after dilution and after balancing the pH into the sink and run the cold water. Allow water to run for 1 minute. The procedure of disposal of chemical like Hydrogen peroxide should include lab-specific information on waste disposal. One should wear proper PPE, decontaminate equipment, benches and chairs with soap and water. The containers should be rinsed thoroughly before disposal in order to avoid any kind of explosion. Check general instructions of “Hazardous waste management” given in EH&S fact sheet and label the containers of hydrogen peroxide. Hydrogen peroxide waste should be sealed in a chemically compatible container with a specific label mentioned above for proper disposing of hazardous waste. Hydrogen peroxide waste should be stored properly in closed containers and place them in a designated location. Wastage of Hydrogen peroxide should be treated with sodium thiosulphate first and then stored in a properly labelled waste container. Dry waste should be stored in transparent double bags. One who is handling the wastage of Hydrogen peroxide must have proper control on gathering and disposing this waste. The Hydrogen peroxide waste should be regularly disposed of within 6 months. One should consult nearby pharmacy or waste pick-up schedule. Can I take expired Mucinex products? Expiry and Honey. Can you eat expired Honey?